This paper describes the results and method of testing conducted to establish the feasibility of using a Nikonos port wired with all pins active in order to drive the Inon Optical Converter attached to a Sealux CD70 housing. 1. The testing was performed using the Inon optical converter with Inon D180 strobes both independently and in combination with the Sealux CX-800 on the left hand port. 2. The testing was performed using the Ikelite DS-50 substrobe & Ikelite manual EV controller both independently and in combination with the Sealux CX-800 on the left hand port. 3. All tests were performed using the 5 pin Nikonos strobe port from an original Nikonos 5 camera case. The Nikonos 5 pin port contained within an original Nikonos 5 camera is functionally and electrically identical to that of the Nikonos style port supplied by Sealux. The method used was as follows. 1. The internal parts from an original Nikonos 5 camera were removed exposing the wires to the the Nikonos 5 pin port which is an integral part of the Nikonos camera case. The exposed wires on this test Nikonos port were connected to the Sealux CD70 strobe hotshoe using the internal socket as per the image below. 2. All five pins on the test Nikonos port were wired according to the image below. It was observed that the Nikonos 5 pin port contained within an original Nikonos 5 camera contained a resistor on pin E. The resistor measured 0.83 M Ohm. It is assumed the Nikonos style port supplied by Sealux would function in the same way. The results of the testing are described as follows. 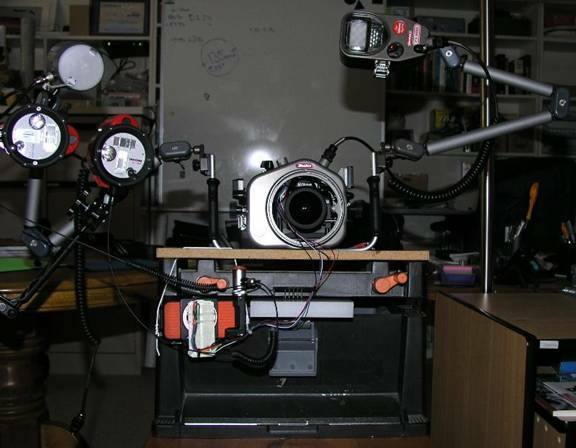 Two Inon strobes were tested connected to the Inon Optical Converter which was plugged into the test Nikonos 5 pin port. All combination of tests were successful. The Sealux CX-800 was tested with the Inon strobes turned both on and off. This was successful. The Inon strobes were tested with the Sealux CX-800 strobe turned on and off. This was successful. The Inon strobes were tested with the Sealux CX-800 unplugged from the housing left hand port. This was successful. The Ikelite DS-50 was tested on this Nikonos port with the Sealux CX-800 strobe plugged into the left hand port and switched on. The DS-50 would fire only once when the DS-50 substrobe & Ikelite manual EV controller were connected to the Nikonos port using the 5 pin configuration. Subsequent attempts to fire the strobe on shutter release produced an on-camera warning showing that, ‘The camera is set to TTL mode but the connected flash does not support TTL'. The Ikelite DS-50 was tested on this Nikonos port with the Sealux CX-800 strobe plugged into the left hand port and switched off. The DS-50 would fire only once when the DS-50 substrobe & Ikelite manual EV controller were connected to the Nikonos port using the 5 pin configuration. 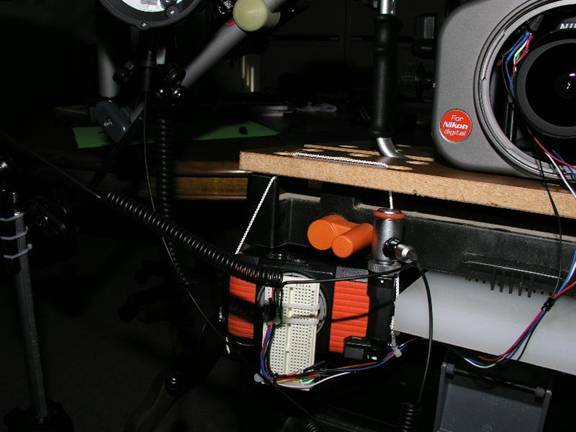 Subsequent attempts to fire the strobe on shutter release produced an on-camera warning showing that, ‘The camera is set to TTL mode but the connected flash does not support TTL'. The Ikelite DS-50 was tested on this Nikonos port with the Sealux CX-800 unplugged from the housing left hand port. This was successful. The Nikon SB800 functioned successfully in the combination of tests with the Inon strobes in Manual and Automatic modes. The Nikon SB800 would fire only once when the DS-50 substrobe & Ikelite manual EV controller were connected to the Nikonos port using the 5 pin configuration. Subsequent attempts to fire the strobe on shutter release produced an on-camera warning showing that, ‘The camera is set to TTL mode but the connected flash does not support TTL'. The Inon strobes appear to work well using the above pin wiring; both independently and in combination with the Sealux CX-800 strobe plugged into the left hand port. The Ikelite DS-50 strobe & manual EV controller does not function correctly in combination when the Sealux CX-800 strobe is plugged into the left hand port even with the SB800 switched off. The only way to get the DS-50 to function correctly with the above pin wiring is to unplug the Sealux CX-800 sync cable so the SB800 is completely removed from the circuit. 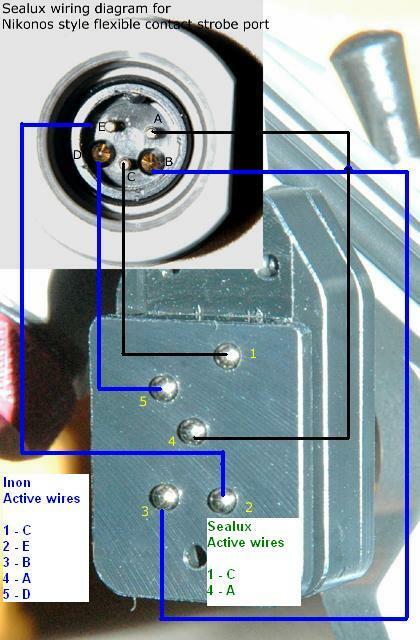 Based upon these test results I requested that Sealux send me a Nikonos style port with all 5 pins wired in the above configuration as per the image below. Since I did not intend to use the Ikelite DS-50 with this housing it would not be an issue if the DS-50 did not function correctly in tandem with the Nikon SB800. I expect that the two Inon D180 strobes used both independently and in combination with the SB800 will provide me with an ideal lighting solution. Sealux obliged by testing and sending me the fully wired Nikonos port, which I duly installed. It turns out that the new port uses the traditional wiring configuration employing all five pins on the Nikonos port. This works perfectly with the two Inon strobes and the housed Nikon SB800 allowing me to use one two or three strobes in any combination. As mentioned, when using the Nikon SB800 with the Inon strobes only the Automatic or Manual mode on the strobe can be used. Thanks to Iain Anderson for providing the Nikonos 5 for the test. Thanks to Jurgen at Sealux for his support. 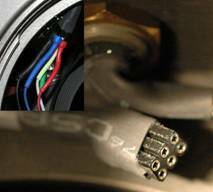 Thanks to Inon for providing a ‘for reference only’ pin configuration guide for their optical converter. Thanks to Dave Moran of SeaTech, NZ for providing support on Ikelite products.